Craps is a casino dice game where two dice are thrown and players bet on different dice combinations. While it may seem complicated at first, once you understand the general game play it’s not only fun but you win lots of cash! Craps is a dice game where you can predict and bet on the number outcomes of two dice over multiple betting rounds. It is an incredibly popular casino game but can be difficult to understand at first due to the specific rules and all the numbers involved. A standard craps table has up to three dealers and up to eight players around the table. A pair of dice are passed around clockwise and players can choose to either roll or pass depending on what suits them round by round. Of course, there are some differences when playing online, but we’ll get to that later! The following page will show you exactly how to play this incredibly popular casino game and teach you the basic terms, table layout and strategies that will help you win! If you study a standard craps table closely you will see that both sides of the table are identical, and essentially mirror each other. The layout of the craps table allows players on one end of the table to play at one side and players on the opposite side to play in the same way on the other side. The two sides of the craps table include squares for the come out bets, and the bet lines in the middle of the table are referred to as proposition bets or single-roll bets. Depending on the stage of the game you would need to pay attention to different parts of the craps table. 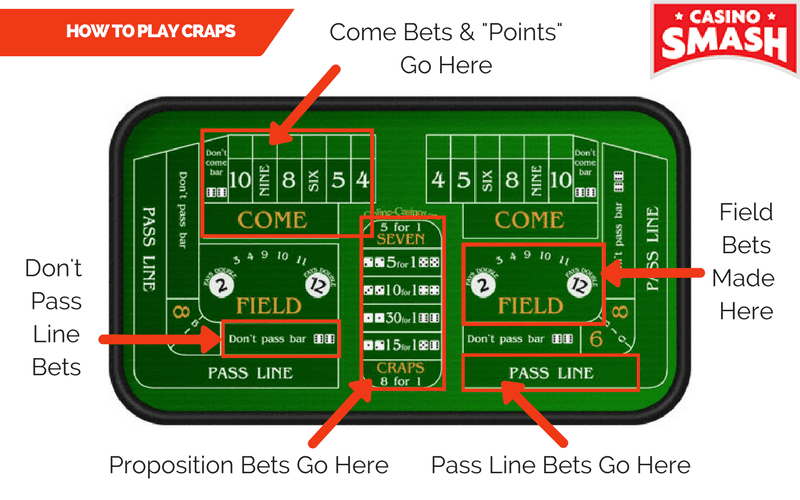 The following section will explain the rules to help you gain a better understanding of the craps table layout and where you need to place your chips as the game progresses. In terms of craps rules, they vary depending on the bet you’re making. In the game of craps there are single roll bets which are done later in the game and multiple roll bets starting with the very first bet of the round; the come-out roll. A betting round is over when the previous shooter (basically the person who bet before your turn) makes a losing roll. A player loses a roll if they either fail to make the point or they seven out. Wait, what is the “point”? On your first roll, you will take two dice and throw them towards the other end of the table. If your two dice are a 7 or 11 this is called a natural and you automatically win and get to roll again. If you roll a 2, 3, or 12 this is called craps and you lose but still get to roll again. The third possible outcome for your come-out roll is that you get a dice value of 4, 5, 6, 8, 9 or 10. If you get one of these numbers then this is called a “point”, which the dealer will mark on the craps table with a white puck. Your goal at this point would be to roll the number again before rolling a 7, in which case you would “seven out” and lose. If you or any other shooter makes their point, they get to shoot again. However, they will be shooting another come out roll, and beginning a new betting round. It seems a little confusing right now, but let’s go over it in more detail to clarify these bets even further. As we went over earlier, the craps layout consists of different areas with various betting options. So be sure to place your bet in front of where you are standing at the table. Since both sides are identical it should be easy to reach the box you’re looking for. Not only do you bet on yourself when playing craps, but you also bet on the outcomes for every shooter at the table, and you can choose to bet that they will win their round or lose. When you place your chips on the Pass Line this means that you are betting with the shooter and that the shooter is going to pass or “win”. The shooter wins if the first roll is a Natural (7 or 11) and loses if it is Craps (2, 3 or 12). If, on the come-out roll, a point is rolled (4, 5, 6, 8, 9, 10), the dealer will mark the point with the puck and flip it to read “On”. Now that the shooter’s point is marked the shooter must roll his or her point before a 7 is rolled to win. Once the point is rolled by the shooter the puck will moved to “Off” and the shooter will shoot all over again to get a brand-new point. If a 7 is rolled before the shooter can make the point, the Pass Line bets lose and the dice go to the next shooter on the table. Once a point is rolled, you can make this additional bet by taking odds, and these bets are placed behind each player’s Pass Line Bet. Most casinos allow you to have double odds, meaning depending on the amount you have on the Pass Line you can have double that amount placed behind the Pass Line bet. Now other casinos offer more odds, so always be sure to check the options before you play. The following small tutorial will teach you the terms you need to know when it comes to making all major and minor bets while playing casino craps! This bet can only be made after the Point on the Pass Line has been determined. After you place a Come Bet, the first dice roll will set the Come Point. Your Come Bet will win if a Natural (7 or 11) is rolled and will lose if Craps (2, 3, or 12) is rolled. Future rolls will make you a winner if the Come Point is made before a 7 is rolled. If a 7 is rolled before the Come point is made, Come Bets lose. Same as Odds on Pass Line Bet however you take odds on the Come Bet, not the Pass Line Bet. This is the reverse bet to the Pass Line Bet. Wins if the come-out roll is a 7 or 11 and loses if a 2 or 3 is rolled (12 is a tie/push with the house). If a Point is rolled, the Shooter must roll a 7 before the Point is repeated for this bet to win. If the Point is rolled first, the bet loses. This is the reverse to the Come Bet. After the Come Point has been established, you win if the shooter rolls a 2 or 3 and lose with 7 or 11 (12 is a push). If a Point is made, then Don’t Come loses if the point is repeated and wins if a 7 kills the Point. Same as Odds on Pass Line Bet and Odds on Come Bets, but the odds payouts are backwards. For example, instead of being paid 2:1 when winning on a point of 4 or 10, you’re paid 1:2. That means that a $10 Odds bet wins $5. Bet can be made after the Point has been determined. A player can bet on any number on the table. Place Bet payoffs depend on the Point number you're betting on. 4 or 10 pays 9:5, 5 or 9 pays 7:5 and 6 or 8 pays 7:6. You can cancel your Place Bet/s at any stage. These bets hold for one dice roll only. Wins if the shooter rolls 2, 3, 4, 9, 10, 11 or 12 and loses if 5, 6, 7, or 8 is rolled. Field Bet payoff are 1:1 (even money) except a 2, which pays 2:1 and a 12, which pays 3:1. Can be placed on any roll. Wins if 6 or 8 is rolled before a 7. Both bets pay 1:1. Any Craps: Wins if a 2, 3 or 12 is rolled and pays 8:1. Any Seven: Wins if a 7 is rolled and pays 5:1. Eleven: Wins if an 11 is rolled and pays 6:1. Ace Deuce: Wins if a 3 is rolled and pays 16:1. Aces or Boxcars: Wins if a 2 or 12 is rolled and pays 30:1. Horn Bet: Acts as a bet on 2, 3, 11 and 12 all at once and wins if one of these numbers are rolled. Horn Bet pays 8:1 for 2, 3 and 12 and 16:1 for 11. If you win a Horn Bet, the other three bets are lost. Hardways: Wins if a Hard number is thrown (2+2 for 4, 3+3 for 6, 4+4 for 8 and 5+5 for 10) before a 7 is rolled or before an Easy Way combination of the Hard Way totals is hit. 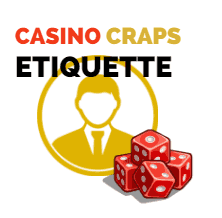 As you can see, craps is a complicated casino game to learn and master thanks to the massive number of different craps bets as well as different sets of rules associated with each of these betting options. While the game can be overwhelming at first glance, this is also what makes the game so fascinating. Once you get to understand the details and rules of craps, it can also be one of the most enjoyable online casino games out there. There are also some strategies to win you can start using once you’re more comfortable, which we’ll be covering next! The main idea of the Martingale System is to double one's bet after every loss so that the next win would cover the money lost from previous bets. However, this strategy does not always tend to work, as a series of lost games or hands might lead to losing the whole bankroll. Knowing how much you can afford to lose is very important, and setting boundaries does not necessarily mean that you will lose, but it applies more to your discipline. To be a disciplined and winning craps player, you need to understand the odds of each bet and what is at stake each round. You should also know what wagers you can take, and this usually depends on your bankroll. The bets should not be higher than 1/20th of the amount of cash at your disposal. For example, if your bankroll is $400-$500 you are advised to place $10 bets on the craps table. There is no cheat sheet or trick that guarantees that you’ll win. Like most casino games or any game for that matter, winning at craps is all about having a solid strategy and enough focus to stay objective in the face of serial losses. The wisest bets are those which pay even money or double your wager. Although they do not bring instant fortune, they are usually more beneficial in the long run. This craps strategy urges you to choose the betting options which provide the best odds. The more likely outcomes will keep your bets safer, as the chances of the positive outcome are much higher. After playing for some time for free you can then switch to real money games, starting with low wagers and gradually increasing them. This kind of step-by-step integration will help you gain better control of your game than by getting instantly involved in big money craps games. There is a lot of etiquette you need to consider when you’re at the dice table at your local casino, and the most important thing to remember is that at a dice table you always want to place your bets while the dice are at the center of the table. This also applies to when you want to buy chips. After you buy chips from the table you want to keep your chips in front of you on the chip rail. You don’t want to have your money on the table unless you are making a bet. The stickman will make sure that everyone is ready before he gives the dice to the shooter. Once the stickman gives the dice to the shooter you don’t want to be getting your hands in the way because if the dice hits your hand at the craps table, you’re going to make a lot of enemies. If a dealer has been nice to you and you want to give him a token of appreciation you can either give him a tip while you’re playing or you can make a bet for him. Another popular bet is a two-way bet; which is one-way for you and one-way for the dealer. For example, if you want to do a two-way hard eight bet, you’ll place $2 on hard eight. One-dollar is for you and the other is for the dealer. If you want to play craps online there are plenty of excellent casino sites to choose from. The following list not only includes our most highly recommended online craps casinos, but you can also claim exclusive cash bonuses to boost your bankroll before hitting the dice table!